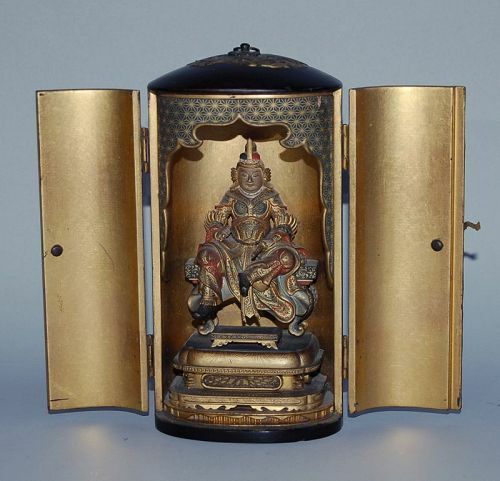 Extremely fine zushi, Buddhist shrine which contains a very rare depiction of a sitting guardian in Chinese armor and helmet, possibly Komokuten, guardian of the West. He sits on a bench, his legs semi-crossed, holding a sword in his left hand, and a short Vajra-like object (partially missing) in his right. A footstool beneath his feet. Soft wood decorated with mineral colors and gold, painted in very fine details. Black lacquer zushi with gilded metal hardware, finely engraved with flowers. The top decorated with a gilded and engraved metal ornament in the shape of chrysanthemums. Which is highly unusual. Japan, mid-19th century. Circular zushi in the shape of a covered bowl, decorated on the inside and outside with very dense nashiji lacquer, with inlaid mother-of pearl butterflies and a flower, hexagonal rock crystal door knobs. Inside sits the eleven-headed Bodhisattva Kannon (Juichimen Kannon), holding a lotus bud in his left hand, his right hand turned downward in ‘fear not’ mudra, on a lotus dais between clouds. The Kannon figure finely carved in soft wood with red and blue pigments and gold paint for the details. 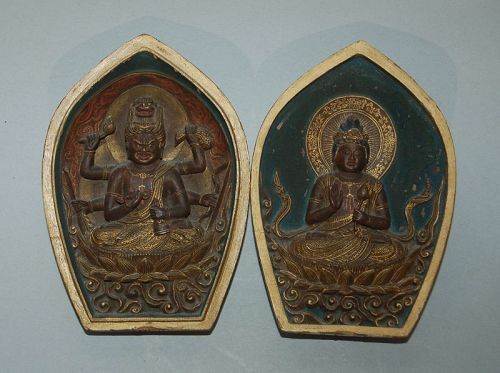 Doors painted on inside in mineral colors and gold with the shitenno, the guardians of the four directions. 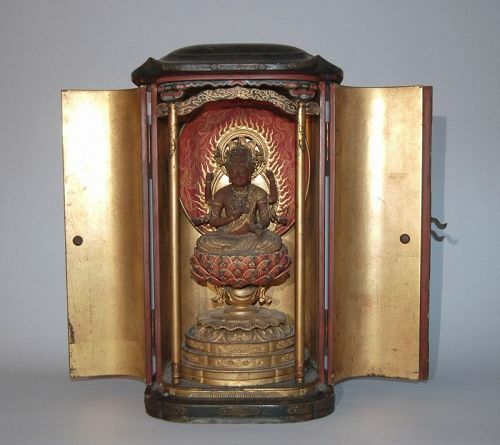 Kannon in excellent condition, painting on doors rubbed off in places, doors with damages (rehinged, loss of applications), consistent with usage. Provenance: Gift of Frank Judson Dudley, Jr (1891-1962) to the Columbus Museum in Columbus, Georgia (accession no. 1966.58 on back of zushi). Deaccessioned from the museum in 2018? There are 7 heads visible and in the middle of the crown stands Amida Buddha. Juichimen Kannon represents the 10 stages required to attain enlightenment, with Amida Buddha representing the 11th stage, enlightenment or Buddhahood. 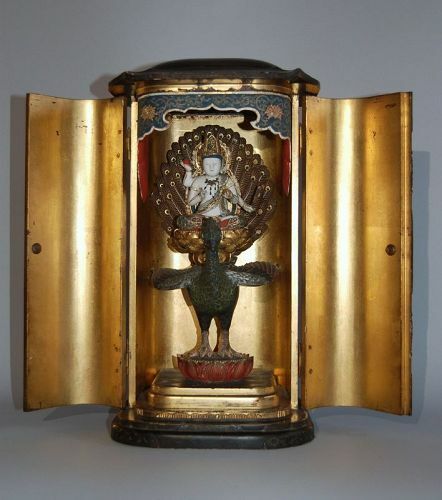 Large two-door shrine holding inside the figure of Kujaku Myoo sitting on a lutus dais on the back of a peacock. Kujaku means peacock and is revered for transmuting the "poisons" of greed and anger and for eliminating karmic hindrances. The peacock (in India) eats poisonous plants and snakes and is thus thought to guard against evils from poisoning or calamity. Kujaku has four arms, holding a pomegranate, peacock feather, and either a lotus flower or a Buddha-fruit (one attribute is missing). Wooden carving decorated in colors and gold, jewelry and one attribute in metal. Bottom dated Kaei 5 (1852) and inscribed with maker’s name. Japan. Colors on peacock chipped (touched up), gilding on feathers that form the halo and on the garment brittle and flaking, white pigment on Kujaku with chips and small cracks, one attribute to Kujaku missing, some of the crown missing. All damages consistent with usage and age. All in all good condition. Zushi, shrine used in Buddhist temples, containing a statue of Aizen Myoo. He sits on his typical lotus throne carried by a vase full of jewels, surrounded by a circular, red, flaming nimbus. He has six arms and on his head he wears a crown in the shape of a lion’s head flanked by two gilded sharito reliquaries. In his lower hands Aizen holds a ghanta and a bell, the secondary hands hold arrows and formerly held a bow, the upper pair of hands used to hold probably a rope and a jewel. Sandalwood decorated with gold and black and red. Jewelry made of gilded copper and glass beads. Japan, Edo period, 18th century. H zushi ca. 16 inches; figure of Aizen ca. 5 inches. Figure: one are re-stuck with glue, others joints showing small seams, some beads missing in gilded jewelry. Zushi: some lacquer chips on the doors, edges and other traces of obvious age and usage. All in all very good condition. Small scroll painting of the monk Ikkyu dancing on top of the head of a skeleton, who is playing the shamisen. Scene from the story of the Hell Courtesan, as described by Santo Kyoden, the equivalent of memento mori. Signed and sealed at lower right by the artist. Ink, mineral colors and gofun on silk. Japan, early 20th century. Painting 34 ¼ x 8 in. Mounting 55 x 11 ½ in. Mounting a bit dry, causing some horizontal ribs. Otherwise very good condition. 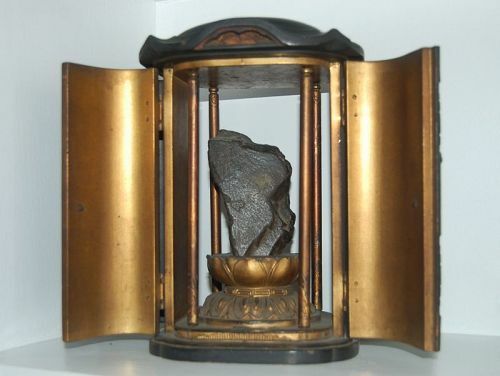 Small zushi hand shrine in the shape of a lotus petal. Inside the Raigo (Amida Nyorai coming from the Western Paradise, greeting the souls of the deceased and inviting them to follow him to Paradise). 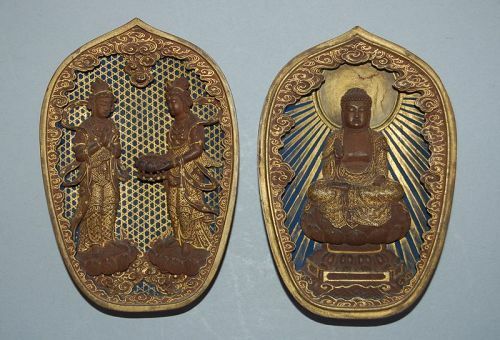 One half carved is carved on the inside with Amida Butsu sitting on a lotus throne, his hands in mudra, the other half is carved with Seishi bosatsu and Kannon bosatsu. Seishi has the hands folded together to express joy over receiving a new soul into Paradise. 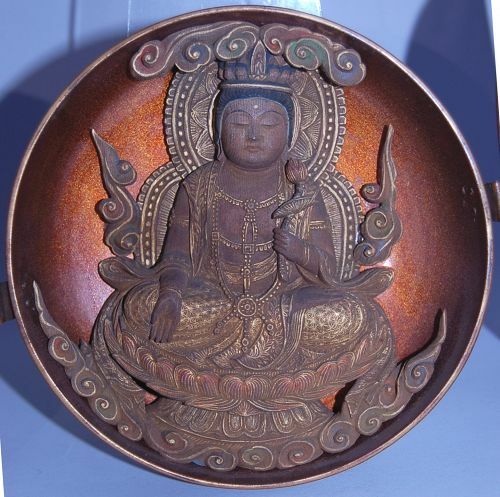 Kannon holds a lotus flower. Wood decorated in lapis lazuli blue, overpainted with immaculate lines of gold. The outside covered in gold lacquer. Japan, Edo period, 18th century. Tip of zushi broken and repaired on one side with very little loss. Some traces of age and usage, but all in all in fine condition. 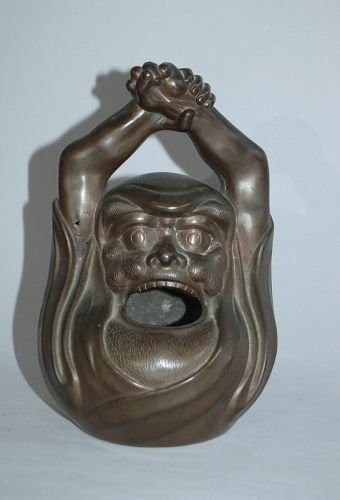 Small handwarmer, or te-aburi, in the shape of a yawning Daruma, stretching his arms above his head. The back of his head left open to put in and take out the charcoal. Could theoretically also function as an incense burner. Bronze with brown patina and fine engraving. Japan, Meiji/Taisho eras, 1910s-1930s. Few casting flaws, one repaired, otherwise fine condition. Midsize Buddhist shrine, zushi, with double doors on front and back, housing a suiseki (scholar’s rock) placed on a lotus base. Zushi black lacquer on outside with brown copper hardware engraved with flowers, the roof decorated above the doors with cranes painted in black ink. Inside covered with gold lacquer, the pillars decorated with lotus petals. Japan, Edo period, 19th century. Some traces of usage (chips on lotus base, rubbing of painting), one door with minor damage on inside, otherwise excellent condition. Fairly large zushi hand shrine in the shape of a lotus petal. Double sided, made of sandalwood. Inside each half is a deep relief carving of Buddhist deities. On one side the three-eyed Aizen Myoo with a lion crown, sitting on a lotus base in the clouds before a red mandorla. His six hands hold Vajra and ghanta, bow and arrow, and lotus bud and pouch. On the other side the two-armed Kannon bosatsu, holding a lotus bud in the left hand, sitting on a lotus base in the clouds. Inside decorated in gold, red, blue and black for details, green mineral color for the background. The outside decorated in gold lacquer over a black lacquer ground: loose lotus petals and a bonji on each side (one bonji probably for Fugen and one bonji A (for Amida)). Japan, Edo period, around 1800. Inside in excellent condition with minimal abrasions of the blue in the hair and of the green background pigment. Black lacquer on the outside with some losses. Above the bonji for Fugen (?) a restoration. Wood a bit warped. Tiny zushi, or hand shrine, with double doors on two sides. 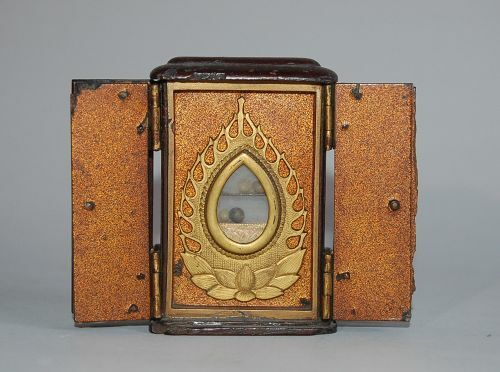 Inside a two-sided reliquary with tiny stones, in the shape of a flaming jewel, or tama, on a lotus base in gilt copper alloy and glass. Shrine made of kiri wood (paulonia), inside covered with lacquer with nashiji gold sprinkle. Outside mounted in gilt metal hardware with nanako decoration. Japan, Edo period, 18th century, possibly earlier. 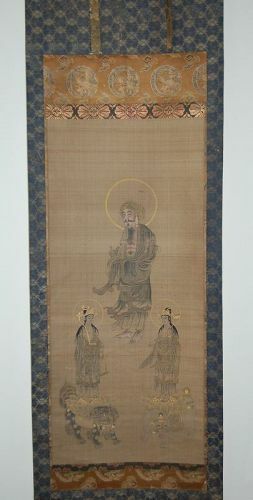 Hanging scroll, Shaka Nyorai, Fugen and Monju bosatsu, Japan 19th c.
Highly unusual painting of the Shaka sanzon, showing in the center of the painting the Historical Buddha Shakyamuni with thick black hair on his chest and very long toe nails. He is flanked by the bodhisattvas Fugen standing on the elephant and Monju standing on the lion. Fugen and Monju have abnormally long noses. The noses resemble the noses with which the Japanese used to image foreigners (Portuguese, Spanish, Dutch). Black ink, gold and light colors on silk. Gilt copper scroll ends. Japan, 19th century. Painting in very good condition, mounting with traces of usage. 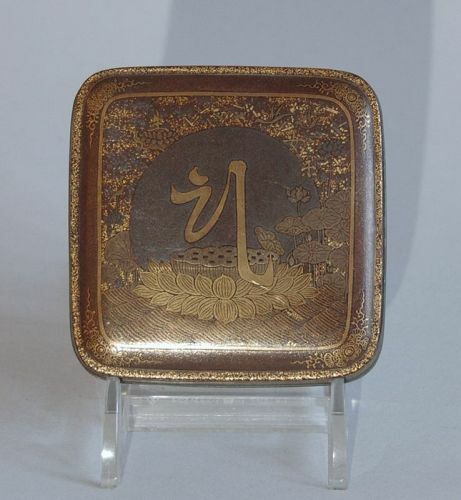 Small square kogo, box for storing incense. Cover decorated in gold and silver hiramaki-e and nashiji gold flakes with the Sanskrit or Siddham character Sa, sitting on a lotus base, floating in a lotus pond. Sa stands for Kan'on bosatsu. On a lotus base in the upper left corner, sits the character for life (sei) and on the upper right float two characters: woman (onna) and wood? (ki) between bird-like shapes. Inside nashiji gold flakes of different sizes. Pewter rims. Japan, Edo period, 18th century. H 3/4 x W 2-1/2 x D 2-1/2 in. Some deep chips on the edges of the cover, lacquer dried, some shallow dents on cover (lotus). Old inventory number in red lacquer on pewter rims: 31.50.170. 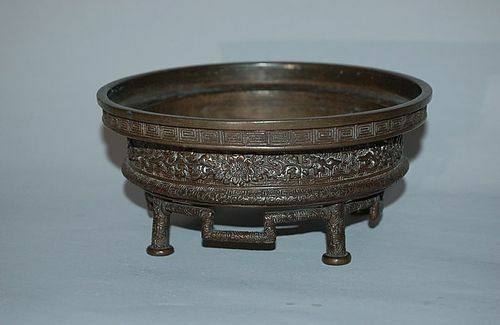 Finely cast bronze censer on four linked feet with very elegant flower décor on the body and fretwork on the rim, patinated in a rich brown. Bottom decorated in low relief with repeating, extremely fine fretwork of faces. Seal on bottom: Dai-Nihon Bunsei nen Seimin sei. Japan, Edo period, early 19th century. H H 2-7/8 x diam. 6 ½ inches. Murata Seimin (1761-1837), bronze sculptor active in Edo, well-known for his fine casting of bronze vessels and animals. Painting in watercolor on paper of the Fujin statue in the Taiyu-in, the Mausoleum of Tokugawa Iemitsu, in Nikko. Beautiful details. Signed: Yokotsuka, Nikko. Framed in the original wooden frame, with imitation gilt copper corner decoration, applied in low relief stucco. Japan, Taisho era, 1910s. About Yokotsuka no information could be found. Apparently he was active in the Taisho era and he has made other watercolors with scenes from Nikko. Measurements with frame: 20½ x 17 inches. Very good condition. Frame with a few scratches and scuffs, but basically in very good condition. 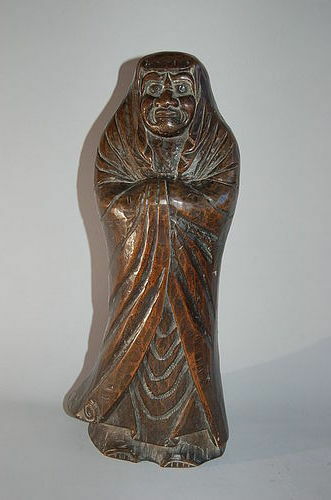 Sculpture of Daruma, Buddhist patriarch, sitting wrapped in his garment, chest and face bare. Cast bronze with beautiful brown patina. Cast seal in back, illegible. Japan, Edo/Meiji era, mid-19th century. Daruma standing tall, wrapped tightly in his garment, the tips of his feet just peeping out. One tip of his garment floating, as if in the wind. The face deeply cut and expressive. Keyaki (zelkova) wood carved in ittobori style. Japan, Meiji era, 19th century. Mingei (folk art). Natural stress crack, typical for keyaki wood, few very old chips in the back that were probably already there at the time of the carving, all in all very good condition.